Pristine preowned mens Rolex Datejust II (ref. 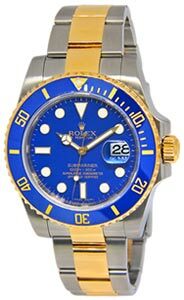 116334; s/n random numbers ) in stainless steel features an 18k white gold fluted bezel, blue roman dial and Oyster bracelet with deployant buckle. Comes with its box as shown. Retail: $9,100.